NEW YORK — During the first half of the Olympics, women have dominated the screen on NBC in the evening. Through Saturday night, 58.5 percent of the competition time on NBC's prime-time telecasts involved women's sports, with 41.5 percent devoted to men, according to research released Monday by three college professors writing a book, "Olympic Television: Inside the Biggest Show on Earth." For all of the Summer and Winter Olympics dating back to 1994, the 2012 London Games was the only competition where women got more airtime than the men — and even that didn't match the imbalance of Rio de Janeiro so far, said Andy Billings, a sports media professor at the University of Alabama. "I think it shows that NBC is very progressive compared to any other form of sports media," said Billings, who conducted the research with James Angelini of the University of Delaware and Paul MacArthur of Utica College. NBC has been among media outlets criticized for incidents of alleged sexism regarding the Olympics. An NBC sportscaster, for example, credited a Hungarian swimmer's husband for a career turnaround. An NBC executive's comment last month that NBC sought a reality show-like narrative flow to its coverage to appeal to women not interested in sports angered some women who are. "We take great pride in knowing that no one devotes more broadcast network prime-time coverage to women's sports than NBC," said Jim Bell, executive producer of the Olympics. Through mid-afternoon Monday, U.S. women had earned a total of 36 medals in Rio de Janeiro, 16 of them gold. Men had 32 medals, nine of them gold. Much of the disparity can be explained by women's dominance in some of the sports that NBC follows most closely in its prime-time telecast. For instance, women's gymnastics has accounted for nearly three hours more screen time for women, Billings said. 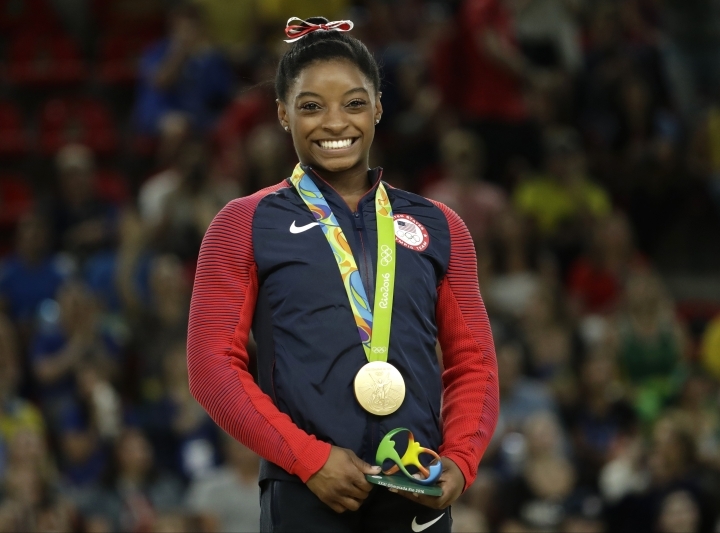 The U.S. women's team and Simone Biles have dominated gymnastics in Rio, while American men have been less competitive. Women's beach volleyball — where the competitors wear bikinis — has logged 2 hours, 45 minutes on NBC's marquee telecast, the study found. The men had been on for 35 seconds. "We'd be naive if we didn't acknowledge that the sports they are showing, a lot of them involve women in swimsuits and leotards," Billings said. While this may appeal to men, it generally doesn't turn off women, he said. Meanwhile, boxing is an example of a sport that doesn't appeal to women at all, and it has gotten no prime-time coverage at all. So far this Olympics, NBC's prime-time audience has been 55 percent women. With the dominance of Michael Phelps, male swimmers have received an hour's more airtime than women, and men had an edge in early coverage of track and field, Billings said. He expects the gender disparity to grow closer by the end of the games. AP Sports Writer Tim Reynolds in Rio de Janeiro contributed to this report.